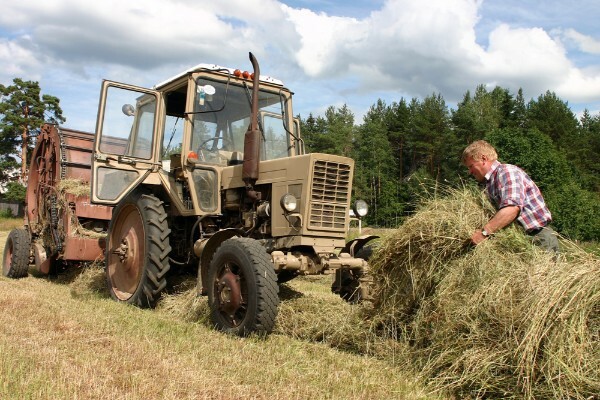 Studies conducted by the United States National Library of Medicine National Institutes of Health have shown that workplaces with farm tractor operators have a high risk of hearing impairment. On average, the risk jumped to 37.9 percent for users of medium-power tractors and 13 percent for high-power tractors. For most farmers, the hearing loss is gradual and may not be noticed until deterioration is serious. Unfortunately, hearing loss is permanent and irreversible. There are some things you can do to help reduce the physical damage and associated hearing loss tractors and other farm equipment can cause. When buying new equipment, try to opt for the machine that operates at the quietest level. Fix mufflers, lubricate bearings, replace worn parts. All these actions will reduce noise pollution and has the additional benefit of helping your equipment run better. Mark areas that are subject to high decibel levels with clear signs indicating them as such. Provide earmuffs or expandable ear plugs for all who enter the area. Make sure you are using the equipment correctly for the maximum amount of protection. Part of the reason protective equipment is so important is because of acceptable sound levels that can reduce hearing loss. For example, information from the 2012 Farm and Ranch eXtension in Safety and Health (FReSH) reports unprotected ears can only stand short instances of intense sound. For example, without ear protection, people should be exposed to the decibel level of a tractor for only 4 minutes per day. Hearing loss could result from 15 minutes of squealing pigs or a table saw, 9 minutes of a riding lawnmower or pressure washer and less than one minute for a chainsaw. When struggling with personal injuries, remember that Maison Law Firm has experience and a history of successful cases behind us. We can put that skill to work for you. Call us today to get a free consultation, at 559-203-3333. It?s a free consultation. There is no obligation, and you owe nothing unless we win!